Spring break wasn’t just about cancelled classes and having fun for all Reinhardt University students. Many students put their time off March 7-11 to good use by improving their knowledge, performing community service and learning new sports. Dr. Cheryl Brown, Dr. SimonPeter Gomez, Elizabeth Smith and Dr. Anne Good took nine students on a trip to Mexico to learn about the culture and to deepen their understanding of the world around them. 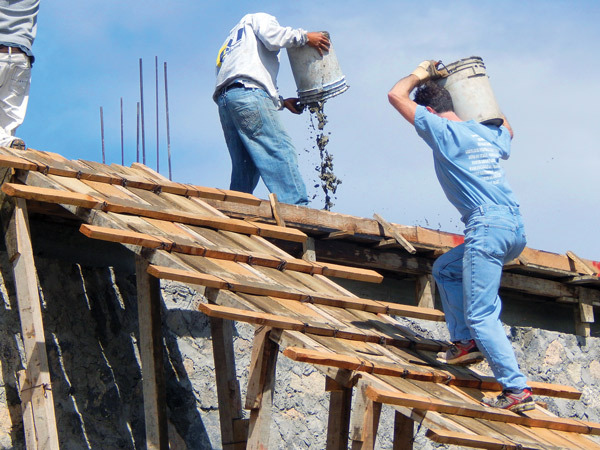 Dr. SimonPeter Gomez carries a 50 pound bucket of cement up the ladder to help finishing roofing the cistern component of the new well system for the village of El Tablon. Dr. Brown co-founded Vidas de Esperanza, a non-profit with a mission to help community development and meet social needs in the area primarly around Ixmiquilpan, Hidalgo, Mexico. She routinely visits the area in Mexico and has been bringing students since 2005. Prior to their trip, students participated in fundraising and supply drives to meet the needs of the people they would be helping in Ixmiquilpan. While they were there, they visited six schools and one university, Brown said. The Reinhardt community greatly supported the effort by raising $3,000 for the well system during fall semester. To make the most out of the trip and the best learning experience for students, Brown said she surveys students before, during and after the trip to allow her a better understanding of what they want to take away from the trip. Dr. Brown is working on planning a study abroad trip to Cuba for next summer. Those interested in studying abroad should contact her at (770) 720-5857 or clb2@reinhardt.edu. Proposals are due April 8. The entire group before going into Thistle Farms: from left, Stephanie Merchant, Marianella Lopez, Juice Arnold, Marvin Monroe, Alex Lee, Ansley Avera, Analicia Blanco, Abby Snelson, Kaylee Rinesmith, Julie Kirk and Ariel Murphy. Rev. Jordan Thrasher took nine students and two faculty/staff to Nashville, Tennessee over spring break where they were able to not only learn about important national history but also give back to those in the area who needed it. The trip was open to the entire campus. The group of students drove to Nashville Monday morning of spring break and stayed the night in the fellowship hall of Vine Street Christian Church. After a little bit of conversation, relaxing and a good night’s rest, they headed to Thistle Farms, an organization originally started from a campus ministry. Thistle Farms is a place for at-risk women who have a history of drug abuse or were victims of human trafficking. While the women go through the program, they work taking recycled items and natural products and turn them into stationary that is shipped worldwide. Those who are still in the program, as well as those who have completed it, can work in the Thistle Stop Café – a local restaurant where the students dined the same day. The students also received a live lesson in history, as two Freedom Riders told their story during the Civil Rights tour on Wednesday of spring break. Avera said they sat and ate their lunch where the sit-ins took place. The students spent Wednesday afternoon as free time, enjoying the sights Nashville has to offer from Broadway Street, Riverwalk and Pinewood Social. They ended the night bonding over bowling. 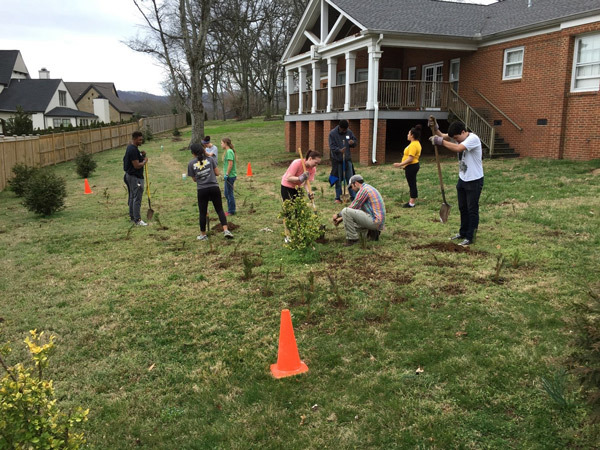 The students were right back to work serving the community Thursday morning as they planted trees and did yard work for Monroe Harding, a foster home for students of many different ages. The foster home started off as an orphanage. After their hours of yard work, the students did not stop – they headed to Workers Dignity (also known as Dignidad Obrera). The organization is place where workers can turn when they feel they have been cheated of their wages. If the issue is not fixed, the organization helps raise public awareness about what is going on. “I never knew that these types of direct organizations existed,” Avera said. Before heading out Friday morning, the group stopped back at Thistle Stop Café for breakfast and spoke more to Donna, who they had met a few days prior. A large part of RU Outdoors’ spring break trip was joining the crew of the Daedalus, a two-masted sailing vessel. Pictured, back row, from left, Aubrie Harding, Clifton Clark, Victoria Cassidy and Tyler Graham, and front row, from left, Avery Miller, Jona Dangel and Ashley Alligood. 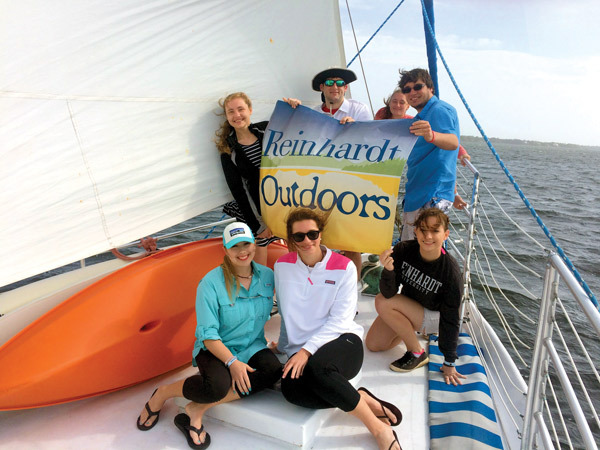 The Reinhardt Outdoors group set sail for their spring break off the coast of Alabama. Dr. Walter May, assistant dean of students and director of student activities, and Steven Vosika, a program coordinator, took 15 students and one alumnus to the Alabama shores where they joined the crew of the Daedalus, a two-masted sailing vessel. They got the chance to cruise the Gulf waters off of Orange Beach and Gulf Shores. Students also got to try paddleboarding after putting in the sailboat near Fort Morgan. “Along the way, we were awed by the stunning natural beauty of this secluded part of Gulf Shores,” May said. In addition to sailing, the students got the opportunity to hike and explore the 6,816-acre Bon Secour National Wildlife Refuge. The refuge seeks to conserve an undisturbed beach and dune ecosystem, which serves as a refuge for endangered and threatened plant, fish and wildlife species, as well as a habitat for migratory birds. When the students and faculty were not sailing and hiking, they enjoyed the beaches and sunshine of Orange Beach, as well as the sights the city has to offer. Reinhardt junior Tyler Graham said the bonding among fellow students was his favorite part of the trip. RU Sophmore Victoria Cassidy said she fondly remembers the day they played volleyball in high wind conditions, which was no easy feat. “Overall, the best part of the sailing trip was playing beach volleyball with 30 mph winds, very challenging, and it was rewarding to get to meet new people from my school with different backgrounds and unique personalities,” Cassidy said. To learn more about Student Activities and what Reinhardt has to offer, visit http://www.reinhardt.edu/Current-Students/Student_Activities/Index.html.